Winston Churchill will feature on the new design of the £5 banknote which will enter circulation in 2016, the Bank of England has announced. The wartime British PM’s image is planned to feature on the reverse of the new £5 note, together with one of his most celebrated quotations. Sir Winston Churchill was chosen owing to his place as “a hero of the entire free world”, said Bank governor Sir Mervyn King. The current face of the £5 note is social reformer Elizabeth Fry. A wide range of historical characters appears on the reverse of Bank of England banknotes, with Elizabeth Fry the only woman among the current crop. The Bank of England governor has the final say about who appears on a banknote, although the public can make suggestions. The latest addition has been announced by Mervyn King at Winston Churchill’s former home of Chartwell, in Westerham, Kent, UK. “Our banknotes acknowledge the life and work of great Britons. Sir Winston Churchill was a truly great British leader, orator and writer,” Mervyn King said. 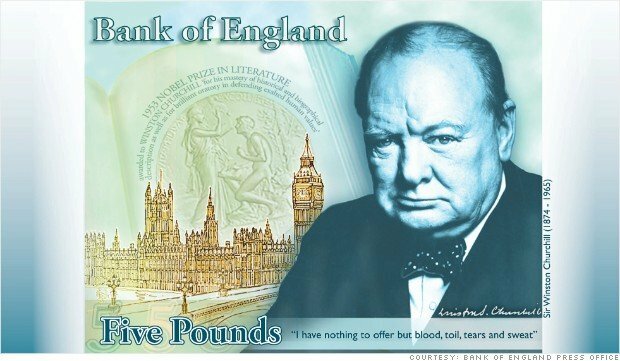 Current plans, which the Bank of England said might be reviewed, are for Winston Churchill to appear on the new £5 note to be issued in 2016. The design includes a portrait of Winston Churchill, adapted from a photograph taken by Yousuf Karsh on 30 December 1941. The former prime minister is the only politician from the modern era to feature on a banknote. Mervyn King said that this was an appropriate choice given the country’s economic difficulties. “We do not face the challenges faced by Churchill’s generation. But we have our own,” he said. The Bank of England issues nearly a billion banknotes each year, and withdraws almost as many from circulation. Notes are redesigned on a relatively frequent basis, in order to maintain security and prevent forgeries. Other security features include threads woven into the paper and microlettering. The most recent new design from the Bank of England was the £50 note, which entered circulation in November. This features Matthew Boulton and James Watt who were most celebrated for bringing the steam engine into the textile manufacturing process. While Bank of England notes are generally accepted throughout the UK, three banks in Scotland and four in Northern Ireland are authorized to issue banknotes. Pharmacologist Sir Alexander Fleming, poet Robert Burns, and tyre inventor John Boyd Dunlop are among those who appear on these notes. One commemorative £5 note featuring football great George Best proved so popular that the limited edition of one million sold out in 10 days. In May, a new 5-euro note will be put into circulation by the European Central Bank (ECB). It features an image of the Greek goddess Europa, which comes from a vase in the Louvre Museum in Paris. The image of Winston Churchill has featured on currency before. He was the first commoner to be shown on a British coin when he appeared on the 1965 crown, or five shilling piece. Winston Churchill, elected as a Conservative MP in 1900, served as chancellor in Stanley Baldwin’s government. He replaced Neville Chamberlain to become the wartime British prime minister in May 1940 until 1945. He returned to office in 1951, and retired in 1955, aged 80. “The Bank is privileged to be able to celebrate the significant and enduring contribution Sir Winston Churchill made to the UK, and beyond,” said Chris Salmon, chief cashier of the Bank of England, whose signature will also appear on the banknote. He described the move as a great honor for the family. Gwyneth Paltrow brands her Antonio Berardi dress from Iron Man 3 premiere a "disaster"